The Plymouth War Memorial is located on Plymouth Hoe at the junction of Lockyer Street and Citadel Road. The Plymouth War Memorial on Plymouth Hoe. It was designed by local architects Mr H L Thornley, FRIBA, Mr A V Rooke and Mr J Leighton Fouracre, FRIBA. The sculptor of the large female figure, over eight feet tall, was Mr Birnie Rhind, RSA, of Edinburgh. 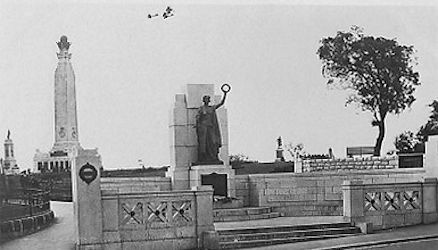 The Memorial was unveiled on Saturday May 19th 1923 as a memorial to those who had died in the Great War, 1914-1918. It was not, of course, known as the First World War at that time since nobody thought there would ever be another like it. The ceremony was carried out by the Secretary of State for War, the Right Honourable Earl of Derby, KG, GCB, GCVO. At the ceremony, the armed forces were represented by Commodore W H D Boyle, CB, Colonel G J H Mullins, CB, Flying Officer Truss, Surgeon Rear-Admiral J Chambers, CMG, MB, Rear-Admiral H L P Heard, CB, DSO, Colonel S E Hollond, CB, CMG, DSO, and Major-General, Sir L J Bols, KCB, KCMG, DSO. The Right Honourable Lord Saint Levan, CVO, the Right Honourable the Earl of Mount Edgcumbe, and the Commander-in-Chief, Admiral Sir Montague Browning, GCMG, KCB, MVO, were also present. During the ceremony, the Mayor, deposited a Roll of Honour in a casket beneath the Memorial. It now also commemorates those Plymothians who gave their lives during the Second World War.